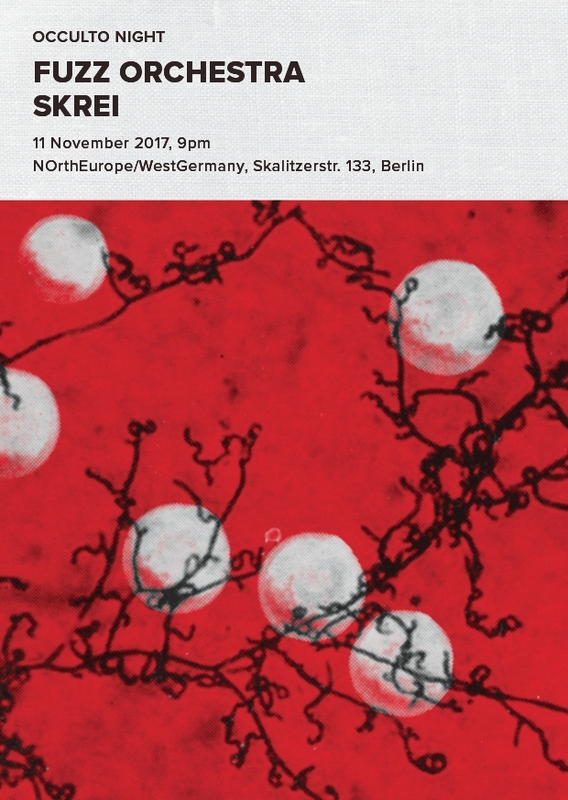 Fuzz Orchestra live in Berlin at the third Occulto Night of the season. Skrei will open for them and celebrate the release of his new record. It's gonna be grand, and loud. FUZZ ORCHESTRA mixes heavy rock sounds with a flux of analog noises and a narrative layer built of voice samples borrowed from old movies and documentaries. Lots of forgotten masterpieces lie in the vast sea of the cultural production from the past, and some of their voices are still true today. Every FUZZ ORCHESTRA album uses these voices to tell its own tales and stories: Fuzz Orchestra (2007) was about some of the most infamous moments of Italy’s contemporary history: fascism and late 60s and 70s State terrorism; Comunicato n°2 (2009) gives voice to those who tried to revolt against the inhuman capitalist world order. Morire per la patria (2012), which sees the entry of Paolo Mongardi (ZEUS!, Jennifer Gentle) on drums, describes and critizes different ways of “Dying for your own Homeland”, from the defense of the borders during the war to the selling of one’s soul to gain power and material richness. Their latest record, Uccideteli tutti, Dio riconoscerà i suoi (2016), tells tales of Revelation, Judgement and Choice; it takes you through different kind of Apocalypses: social, personal, profane and sacred ones. Uccideteli tutti, Dio riconoscerà i suoi also takes Fuzz Orchestra’s music to a new level, putting together heavy rock patterns with contemporary music scores written by Enrico Gabrielli (Mike Patton’s Mondo Cane, PJ Harvey and many more). SKREI is the Noise/Drone project of Giuseppe Capriglione. The loop tape is the only sound element of his live set. Processing and working with multi-tracks tape recorder, he creates an alchemic mixture of Noise/Drone Sounds.